USpicy 32 piece essential makeup brushes set is a set of premium quality makeup brushes for cosmetics professionals, but equally handy for everyday use and people who are learning the art of makeup. I love this USpicy 32 Piece Makeup Brush Set! The makeup brushes come in a cute bag that protects the bristles from getting bent or dirty. There's 32 brushes making this a truly complete makeup brush set! The bristles are soft, full and don't lose any hairs. There's a brush for every technique to help you achieve wonderfully blended makeup. 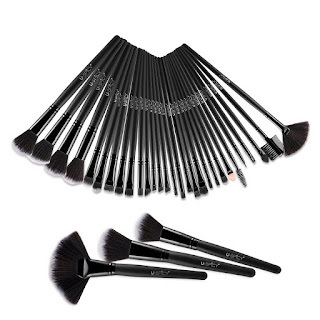 This USpicy 32 Piece Makeup Brush Set is beautiful, looks professional and is a great addition to your beauty routine. 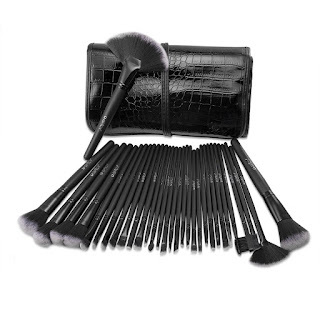 Take your beauty routine to the next level with this USpicy 32 Piece Makeup Brush Set. My makeup looks like it's been professionally done thanks to these wonderful makeup brushes. I highly recommend this USpicy 32 Piece Makeup Brush Set!